Marlin Catalog No. 1237 Miniature Stripanels are molded panels designed to mount No. 1210 miniature Jacks. Connectors are installed from the rear and snap in place with spring clips. They are easily removed by releasing spring clip with a release key. No loose connector mounting hardware. Circuit identification is distinct as each circuit is numbered, lettered and color coded to ANSI standards. Self contained hardware provides front mounting in panels to 1/4" thick. Stripanel is molded of color coded thermoset compound that withstands ambient temperatures to 400°F (205°C) continuous and 500°F (260°C) intermittent. 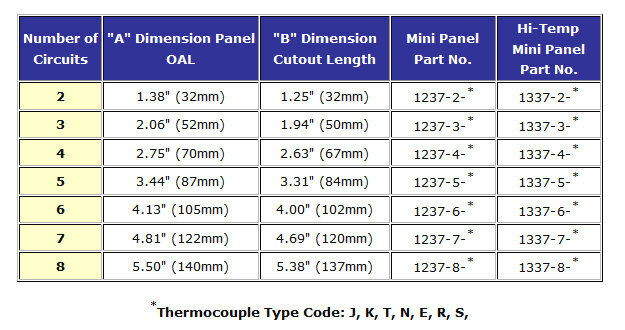 High temperature panels that will withstand ambient temperatures to 800°F (425°C) continuous and 1000°F (540°C) intermittent are molded of a red thermoset compound. Available in modules from 2 circuits to 8 circuits. Standard stripanels are provided with Mini Jacks for horizontal mounting. For corrosive application, gold plated contacts are available. Caution - system errors can result from use of plated contacts if significant thermal gradients exist at connection. NOTE: For special configurations, please contact our office for custom quotations. Click the button below to add the 2-Pole Mini TC Strip Panels to your wish list.